If you are interested, please call 647-8005 or stop by the Center. 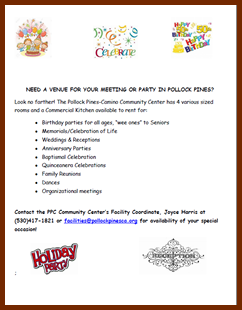 NEED A VENUE FOR YOUR MEETING OR PARTY IN POLLOCK PINES? The Community Center has 4 various sized rooms and a commercial kitchen that is available for parties, meetings, seminars, weddings, receptions, memorials or most any occasion... we can accommodate you and your group. Print your flyer here. To contact our Facility Coordinator, Joyce Harris at (530)417-1821 or to check availability, confirm prices and make your reservations. She will be happy to assist you to make your event a success! 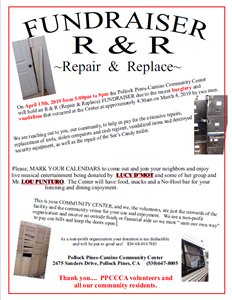 We are reaching out to you, our community, to help us pay for the extensive repairs, replacement of tools, stolen computers and cash register, vandalized items and destroyed security equipment, as well as the repair of the See’s Candy trailer. Please, MARK YOUR CALENDARS to come out and join your neighbors and enjoy live musical entertainment being donated by LUCY D’MOT and some of her group and Mr. LOU PUNTURO The Center will have food, snacks and a No-Host bar for your listening and dining enjoyment. Print your flyer here. This is your COMMUNITY CENTER, and we, the volunteers, are just the stewards of the facility and the community venue for your use and enjoyment. We are a non-profit organization and receive no outside funds or financial aide so we must “ earn our own way” to pay our bills and keep the doors open. Join us for Free Dinner with Buy-in on the 2nd Tuesday each month. More details available on the Bingo page. Set aside time on the Second Friday from April to October for our Friday Night Fiesta. Check out the flyer for the menu and cost. Thank you for supporting our Center. Our monthly breakfasts will begin September 8th with more coming on the Second Saturday each month. Watch for more details on this Rotary-based service club for our youth. Check this flyer for future dates and details. Our last breakfast will be May 11th, so plan to attend. 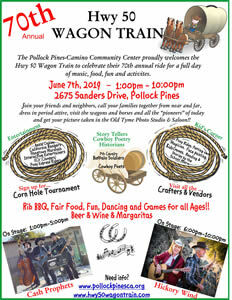 The Pollock Pines-Camino Community Center proudly welcomes the Hwy 50 Wagon Train to celebrate their 70th annual ride for a full day of music, food, fun and activities. Join your friends and neighbors, call your families together from near and far, dress in period attire, visit the wagons and horses and all the "pioneers" of today and get your picture taken in the Old Tyme Photo Studio and Saloon!! Print your flyer here. 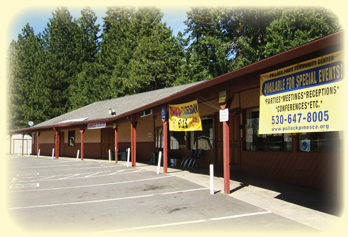 The El Dorado County Senior Nutrition Program is now using the Community Center as its location for lunch services in Pollock Pines. Lunch is served from 12-12:30 Monday through Friday. Suggested donation is $3.00 for adults 60 years or older. People under 60 and even children are welcome to come to the luncheons. The requested donation is $5 per person. Whenever we busy people find time to clean out our homes, it's a good idea to check the medicine chest for expired medication. But where can you dispose of it? The location is no farther than your El Dorado County Sheriff's office at: 300 Fair Lane in Placerville. Pills are accepted, while other medical items may need to be confirmed with their office by calling: (530) 621-5655 during business hours. For citizens in the county over 65 who are disabled, consider this program for establishing a defensible space around your property. Use this link to download your application for assistance. A fire can start anywhere in our community and for any reason, some set on purpose, by accident and a by force of nature. In Pollock Pines we have the American River canyon that poses a very large threat to our community if a fire were to start. The potential winds that could come up through the canyon with a fire could possibly reach Pony Express within hours. ARE YOU PREPARED FOR A FIRE EVACUATION? Prepare with this Pre-Evacuation Checklist. Read this document to prepare for Wildfires. WHEN A FIRE COMES WILL YOU BE PROACTIVE OR REACTIVE? The Community Emergency Response Team (CERT) Program is a nationwide program that educates people about disaster preparedness for hazards that may effect their area. CERT training includes basic disaster response skills such as fire safety, light search and urban rescue, team organization and disaster medical operations. During a major disaster local authorities may be overwhelmed. CERT members are trained to assist others in their neighborhood or workplace when professional responders are not immediately available to help. Their skills can help save and sustain lives until help arrives. CERT can also assist with non-emergency community events. CERT members have been used to distribute disaster education material, provide standby medical aid and direct traffic at parades, community cleanup and other events. In El Dorado County CERT training is coordinated through the Sheriff's Office of Emergency Services (OES). For more information contact Deputy Jordan Thomson (530) 621-7660, . Pollock Pines CERT was formed in Oct. 2006. Our meetings are held at the Pollock Pines Camino Community Center the third Saturday of the month at 9:00 am. Visitors are welcome. Contact Bob Todd at for more information.